A Franco-Russian Seminar on monetary and financial problems of the development of Russia was held in Sochi, from 19 to 22 January 2015. It is the longest lasting institution for scientific cooperation between Russia and France, and this meeting was the 48th session of its kind. It was primarily devoted to the parallel assessment of the economic situation in Russia and the European Union, as well as a review of the impact of sanctions and penalties on the economies of Russia and the European Union. Participants included in particular Victor Ivanter, Director of the Institute of Economic Forecasting, Russian Academy of Science, Jaques Sapir, director of studies at École des Hautes Études en Sciences Sociales (EHESS) in Paris, who teaches at the Moscow School of Economics (Moskovskaya Shkola Ekonomiki), and Claude Rochet, Professor of Economics and Management at Aix-Marseille University, and director of the economic intelligence laboratory at the French Ministry of Finance. The most important presentation, from a Finnish point of view, was the presentation by A.A. Shirov, A.A. Yantovskiy, V.V. Potapenko from the Institute of economic forecasting (Russian Academy of Science) on “Estimating potential effect of sanctions on economic development in Russia and EU“. First lesson: the present crisis in Russia is not due to the sanctions: significant problems in Russia’s economic dynamics have begun since early 2013, when in the first quarter of 2013 the GDP growth rate went down to 0.8% against the same period in 2012 and remained at this level with slight fluctuations during 2013-2014. This stagnation was due to the situation (decreasing prices) of some commodity markets, such as oil, and to a significant reduction in investment activities of major Russian companies. In addition, in 2014, the situation on the world oil market in the fourth quarter did not improve Russia’s and the rouble’s situation and the rouble. As indicated by the authors, “Therefore, it can be stated that the fundamental factors contributing to the unfavourable economic development in 2013-2014 were mostly home-made” . 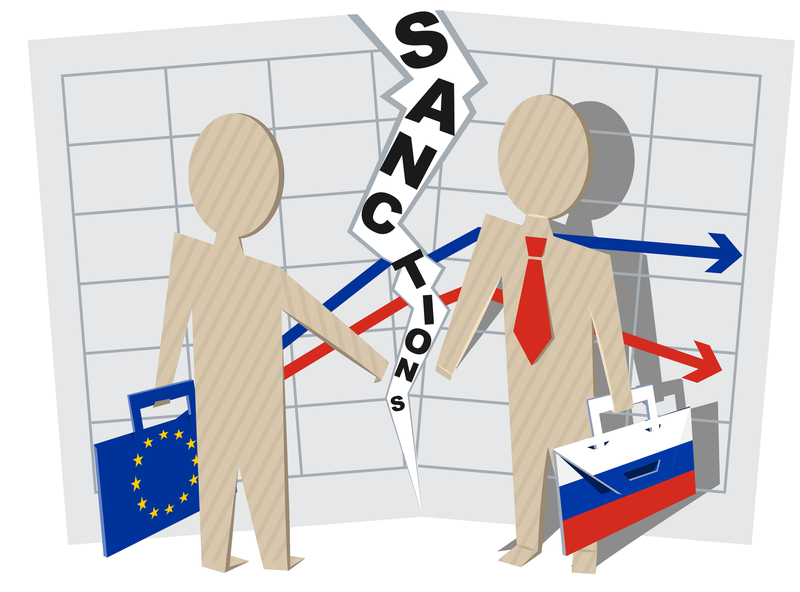 Third lesson: The financial sanctions are harming the European Union countries at a level which would represent 225 millions dollars, or 0,75 % of the EU GNP. There is a direct effect, due to the fact that Russia is going to buy less EU products and borrow less money from EU banks, and an indirect effect due to the consequences on internal markets of the drop of Russian orders. In addition to the impact on the banking system and on the provision of energy, the main industrial sectors impacted are textiles, agriculture and food industry, chemical industry, machinery and equipment, electrical equipment, and transport vehicles and equipment. As indicated by the authors, Russia will suffer more than us: “In nominal terms, the losses of both parties are comparable and macroeconomically significant. However, given the sizes of both economies, the sanctions regime will potentially exert a stronger effect on the Russian economy“. But again it would be reasonable to think that a rapid solution to the Ukrainian conflict would be of high interest for Russia and for the EU. The other ones, such as Asia and the USA , may however benefit from a prolongation. These elements should be taken into account when considering Finland’s situation in the EU. Due to the structure of its external trade, Finland is suffering, probably more than other countries, and there will be an aggravation. The European Union should consider how to support the countries which are the most hit by this crisis, and Finland should benefit from it. And the EU should be more active in this domain, and propose an economic deal that Russia could not refuse, against a solution for Ukraine. ‹ Cutting back public expenses: is Ville Niinistö right, and Stubb, Rinne, Sipilä and Soini wrong?